5 people died in a helicopter accident in New York on Sunday. Only the pilot, 33 year old Richard Vance, survived. The passengers were two 26 year old friends from Dallas, Trevor Cadigan and Brian McDaniel, an Argentinean tourist, 29 year old Carla Vallejos Blanco and two employees of the helicopter company, 34 year old Daniel Thompson and 29 year old Tristan Hill. They were riding aboard a door-off helicopter that used to be reserved for professional photography but has been recently marketed to tourists as well. Because the doors are opened during the entire flight, passengers are secured in complicated harness systems. Unfortunately what made the harness safe when in the sky became a death device during the crash. 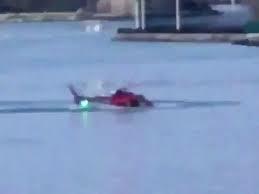 As the helicopter quickly went down in the freezing water of the East River, none of the passengers were able to free themselves from the safety harness. The federal regulators announced yesterday that they would give urgent attention on the use of harnesses for aerial photography. Before boarding the 5 passengers were required to look at a 10-minute safety video which briefly explains that there is a knife in a pocket of the harness that has to be used to cut a strap in the back of the harness in case of emergency . Tourist are often so excited that they don’t really pay attention to the video. Additionally when someone is upside down panicking in freezing water , everything becomes much more difficult. One would hvae to be trained like a Navy Seal to free himself in such difficult conditions. The pilot told investigators that a bag or a strap of a bag may have touched a fuel control switch however experts doubt that this theory is plausible. The pilot then realized he was experiencing engine trouble and decided to attempt an emergency landing. He could have chosen Central Park but he decided to land on the East River instead. The pilot executed what is known as an emergency auto rotation maneuver but the helicopter turned over and sank with the passengers stuck in their safety harnesses. The emergency inflatable pontoons didn’t function proprely. Read more in the NY Post. Investigators also announced yesterday that they recovered a flight data recorder and a GoPro camera that may help them better understand the cause of the accident.